Should You Buy Fuzion X-3 Pro Scooter? When it comes to stunt kick scooters, you cannot be guided by the guidelines of choosing cruising scooters. Those kick scooter types have been designed for different purposes: one was created for doing stunts while the other is meant for simple cruising, as their names imply. If you are looking for a stunt kick scooter, we think we have a good option for you. 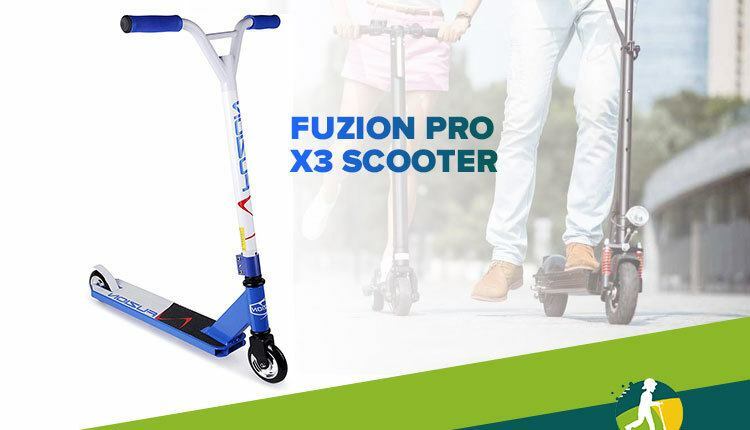 On our Fuzion X3 Pro Scooter review, we will examine X-3 Pro, a great stunt scooter for beginners, not to mention that we are also going to provide you with a buying guide on stunt scooters. X-3 Pro stunt scooter features a 6061 aluminum concave deck, which packs enough in it to withstand a variety of tricks like tailwhips and board slides. The deck has also a nice width to it: it is 4 inches wide! The newly designed neck is strong yet exceptionally light. The neck is connected with the deck through the “faze” fork, which accepts up to 110mm wheels. Overall, the solid 7.1lbs construction of X-3 Pro can withstand up to 220lbs. The custom bars made from contoured HT steel draw inspiration from high-end professional stunt scooter models. It isn’t adjustable, but that’s actually not a bad thing for stunt scooters. X-3 Pro is built from as few parts as possible to ensure that there are no weak points, which is obviously highly important for stunt kick scooters. Another important component of this scooter is its compression system that helps with keeping it constantly dialed, i.e. keeps all the components of the scooter at the correct tension. X-3 Pro comes with an integrated headset compression (IHC) system, which is exceptionally easy to dial the scooter with. You don’t have to take the wheel off to be able to dial the scooter as with some other types of compression systems. Additionally, X-3 Pro is dialed out of the box. Another advantage of X-3 Pro stunt scooter is its easiness of assembly. You only need to put the neck and the deck & fork together and tighten three bolts, and the scooter is ready to ride. As we already mentioned, there is no need to dial the X-3 Pro before the first stunt ride. X-3 Pro comes with 100mm wheels. The 85 polyurethane wheels are right at the center of the hardness scale and are neither too hard nor too soft. Hard wheels are specific to stunt scooters, but X-3 Pro comes with somewhat soft wheels, offering a balance between traction and feel of the ground. This won’t be suitable for advanced riders but will be just right for beginners. The noise-free nylon/steel brake does its job quite good, though it probably won’t be the most efficient brake you can meet on stunt scooters. X-3 Pro comes with installed ABEC-9 bearings, which should be able to deliver smooth riding experience. However, you probably won’t be satisfied with its smoothness if you expect absolutely seamless performance, so you may have to change them. X-3 Pro comes in a wide range of colors, including gold, black, white, red, and others. The color scheme isn’t that crucial, but why not pick a color that can complement your riding style? Toughly built scooter supports up to 220lbs of weight. Easy-to-dial integrated headset compression (IHC) system. A nice range of color schemes. 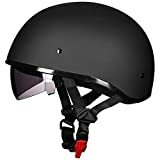 Complaints on the durability of the scooter and the brake in particular. X-3 Pro stunt kick scooter was designed for beginners. Firstly, it is affordable. Secondly, it does have a fairly sturdy construction, but it definitely isn’t the most durable stunt scooter in the world. Besides, the somewhat soft wheels will more or less limit your stunt performing ability. X-3 Pro offers a good balance of features to help beginners get accustomed to stunt scooters. So all in all, X-3 Pro will be quite a good choice for beginners and not so good pick for advanced stunt riders. As we mentioned at the beginning of the review, stunt kick scooters have their own intricacies. It isn’t difficult to buy one, but for each scooter type, you would have to do separate research. Let’s now quickly examine the features of stunt scooters you should be looking for. All those folding and adjustment points on the handlebar and the neck of the scooter make it weaker structurally. A good stunt scooter needs to be durable enough to withstand rough ride and trick riding. You probably won’t see folding or adjustable stunt scooters out there, but know that there is actually a reason behind the absence of foldability and adjustability. X-3 Pro is a great example of this requirement. Smaller and lighter wheels allow the scooter to accelerate faster and make it more maneuverable. That’s why X-3 Pro has 100mm wheels, while some cruising kick scooters may come with as much as 200mm wheels. Small wheels are thus particularly great for tricks. Harder wheels are typically designed for plain surfaces such as parks. They won’t be suitable for cruising because you will feel all the bumps, but they are ideal for stunt riding. The harder the wheels, the less traction they offer, the more they slide, and the better feel of the ground they deliver. That’s why hard wheels are preferred for stunts. X-3 Pro comes with moderately hard wheels. As for the core, you should look for wheels with no hollow parts or spokes. Solid-core wheels, just like on X-3 Pro, are the most durable wheels. Obviously, you want to have as reliable wheels as possible, so go for solid-core models. The compression systems are the mechanisms keeping the kick scooter dialed. Performing stunts obviously throws off the scooter, creating the need for quite frequently dial the scooter. Depending on the type of the compression system, the dialing process can be either quite easy or absolutely annoying. X-3 Pro comes with moderately strong and easy to use integrated headset compression (IHC) system, which is quite similar to the hidden internal (HIC) system. Cheaper stunt scooters can come with Internal/integrated compression (ICS) systems, which cannot be regulated without removing the wheel. The best system is the easy to use standard compression system (SCS), which is perfect for intense stunts thanks to its durability. Cheaper stunt scooters are often equipped with spring-operated brakes, and you should avoid them if possible. The thing is that spring-based brakes wear off quite quickly, starting to annoyingly rattle. If you want to use a stunt scooter for a long time, choose a model with non-spring brakes. Bearings are typically given the ABEC precision rating. The higher it is, the smoother the wheel action is. The best bearings are ABEC 9 models that offer the best precision and efficiency. However, because the ABEC rating doesn’t take into account such factors as load handling capability, materials, noise, lubricant, and others, a higher rating does not always mean better quality. That’s part of the reason why the ABEC 9 bearings included with X-3 Pro aren’t as good as you may expect. While the stock bearings satisfy beginners most of the time, you could easily find better models if you need more precision and smoothness. Performing stunts is the easiest with lighter scooters. Heavy models will fatigue you quite quickly while lighter scooters will allow you to trick around hours long. Make sure to pick the lightest scooter you can. Getting a good stunt kick scooter isn’t as easy as picking the best cruising scooter. There are many more details that need to be accounted for. But we can’t say that it is insanely difficult either. Fuzion X-3 Pro stunt scooter is a great model for beginners. If you liked it, why not give it a try? Otherwise, continue to look for the ideal stunt scooter!